Shortly after the 4th of July holiday, Whole Foods convened its fifth cooking camp, and the experience was, well…as American as apple pie! 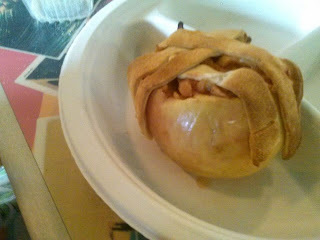 The class instructor let the kids create their own individual apple pie in—get this—a cored apple! Said apple was stuffed with traditional apple pie filling and hint of maple syrup; then topped with a lattice work of dough. Considering that apple pie usually dirties a pie tin and plate, and has a lot more calories and fat when it isn’t served this way, I’d say it’s a waste not-want not proposition. Whole Food’s Mini Apple Pie is pictured here. I can vouch for how good it tasted and smelled. It had a very crisp Fall—back to school—kind of aroma, even if we’re several weeks out from that. 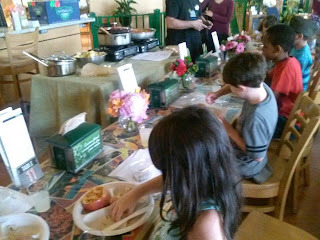 Although this particular cooking class featured lots of different menu items, the apple pie was everyone’s favorite. The teacher actually took a vote! But now to address those other “All-American classics”. The kids also made dairy free mac n’ cheese, dairy free mashed potatoes, and “Sloppy Janes”—a version of the Sloppy Joe, but with turkey meat instead of beef. The whole point of the July 6 menu was to prove that you can always shave off tons of fat and calories with a few cleaver tweaks. 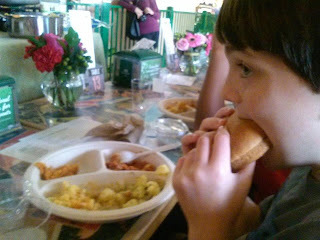 Even if looking great for swim suit season isn’t the issue, sometimes having a food allergy is. So for any Nanas out there who can’t serve their grandkids milk, click on these classic American recipes and see that there’s hope after all! The Dairy-Free Mac n’ Cheese tastes great, but looks a bit weird. If you want to avoid the chunky look of the sauce, get yourself a Vitamix blender for smooth sailing every time you want to customize ANY dressing, soup, topping, sauce, etc. The wave of the healthy eating movement is a Vitamix. The cheapest place to get this space age blender is at Costco or Bed Bath and Beyond, with one of those 20% off coupons that come in the mail. The Dairy Free Mashed Potatoes made this Nana want to use Almond Milk in savory recipes that call for cow’s milk more often—really, really good! Just remember to get the spuds good and steaming hot, so they yield easily to a masher. Your grandchild can do that, rather than use an electric mixer. You add the spices and milk while you mash. F-U-N! The Sloppy Janes had a nice, spicy little kick to them, thanks to condiments from Whole Foods very own 365 brand. Put the seasoned lean meat in between two whole-wheat hamburger buns, and you are setting a great example for health next time you dine with your grandchild. These, plus those mini apple pies, hit the ball right out of the park! Nana’s Kitchen hopes you click all the links and use all the recipes. Thank you, Whole Foods! A person who pursue health sector transition and linguists c ++ it happened two years ago because I felt desperate opponent I switched professions it makes no rival for me in sharing and creativity, as in any case without any motivation to move forward will sia- it alone. After a long time I was drawn back to develop the programming switch to iOS because I think one step ahead with the prohibition of such bans any copying of music and download it nuanced licensed person. May we all be luck as my new business in the health field moving rapidly introduce crystal x phenomenal product that is formulated for today's women.